Advice Watch Calls for Political Signs to be "Punked"
Contending that political signs overall cause more harm than any potential good to society and the environment, and are ineffective in the age of the internet, Advice Watch by Advice Star wants to create public discourse and reexamination of the use of roadside campaign signs by political campaigns. The Advice Watch by Advice Star provides an example of political signs punked! "Who votes for anyone just because they saw a sign with a politician's name on it? It may have worked in the '70's, '80's, '90's, but it's not working in the age of the internet." The Advice Watch by Advice Star (an Oohub, LLC project) has called for a campaign against political campaign signs. In other words, to "punk" the political signs. And says it has very good reasons with abounding evidence that roadside campaign signs are overwhelmingly ineffective, and at best have an unmeasurable effect in swaying votes in any direction. In accordance with its disquisition, they cause more harm to society and the environment than any minuscule effects (if any) that they have on an election. According to its Advice Star Radar service, the results are so unmeasurable that they could potentially sway the small amount of votes that they may bring, in either direction. "Though some may argue that campaign signs bring name recognition, that's not necessarily a good thing. This is the era of rebellion and negative news stories. So the tiny amount of voters who haven't figured out who they're going to vote for by the time they get to the voting booth... If they remember seeing or hearing a politician's name, they're probably thinking something negative about the name, and therefore probably vote against it in a modernly enhanced version of negativity bias," says Advice Watch founder Chad Mitchell. The Advice Watch contends that most roadside campaign signs essentially only have the politician's name on it, asking for a vote. "Who votes for anyone just because they saw a sign with a politician's name on it? It may have worked in the '70's, '80's, '90's, but it's not working in the age of the internet," says Mitchell. In its quash proposition against such signs, the Advice Watch avowals that nothing more clearly demonstrates the hypocrisy and disregards of small business by politicians than their roadside campaign signs. "They make and champion laws against small, even micro entity businesses disallowing them to post signs, while they pave the way for themselves to do so," says Mitchell. For example, HB 1887 in Missouri was designed to disallow property owners including HOA's from banning political signs; but they can still ban any type of sign for small businesses, even home based businesses. "So according to that bill, if you operate a business from home, HOA's can ban you from having even a tiny yard sign about it, but your neighbor who has different political beliefs than you, can post his political sign all day long. It's pathetic," says Mitchell. Worse still, political signs have been found in landfills, lakes, rivers, oceans, and somehow, even on mountainsides. Most political campaign signs are made of corrugated plastic, which nobody really knows for certain how long takes to decompose. The type of plastic used to make these signs provide both floatable and sinkable masses and debris, depending on how or if the furrows get clogged. While nobody has studied the effects that these signs in and of themselves are having on the environment, with 1.8 trillion pieces of plastic in what is known as the Great Pacific Garbage Patch alone, it can't be a good thing. Furthermore, the Advice Watch contends that these signs clog up police activity time; and elaborates: "How many times have we seen stories of police having to respond and take a report about stolen political signs? These signs are vandalized and stolen often. And when they are stolen, what do you think happens to them? The people who stole them don't want them. They just wanted to take them down. So those signs usually just get tossed in rivers and lakes." Further contending: "Pretty much the only people who pay attention to political signs are in rival campaigns, and others who don't like a particular politician. Thus, the signs overwhelmingly just invite vandalism, theft, drama, and mutual thuggery against competing political sides." 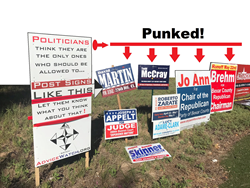 Thus, the Advice Watch wants to see what people can come up with to call attention to what it calls the stupidity and wastefulness of political signs, and asks for submissions of photos depicting such. If they use any photo submitted to them in an upcoming video they will be making, they will compensate the original artist a minimum of $50 with details about how to submit such photos coming soon to their website. Currently, they've just released a new video about political signs punked on YouTube which is to be considered part one and an introduction to the wastefulness of roadside political signs, and an ever-evolving article on the topic at: AdviceStar.com/political-signs which will also eventually provide resources on "how to punk political signs legally and effectively" "..because it's not easy to do. Politicians have seen to that in advance with their outdated thinking", asserts Mitchell.